The Côte du Léon goes from Morlaix to Plouescat, on the north coast of Brittany. 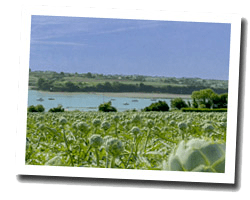 The seaside has a particular charm with artichoke fields planted on cliffs plunging towards the sea. The coastal path offers beautiful views of the sea. At the seaside you can find beautiful white sand beaches for lazing under the Breton sun. 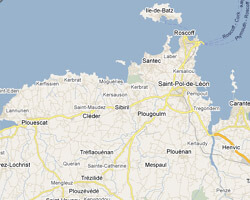 Roscoff is the most famous tourist destination. On the Côte du Léon enjoy a seaview holiday rental. The house feet in the water. Tranquility + Spa. Lara villa & Melanie villa, feet in the water are ideal for holidays in Brittany, the sea views, the living room is upstairs to better enjoy. 3 Bedroom(s), 2 double bed(s). short stays possibility. Final cleaning possibility. House 7 rooms 300m2. Close to the beach. terrace. Swimming pool with jacuzzi. 5 Bedroom(s), Final cleaning : included. Villa 7 rooms 210m2. Close to the beach. terrace. Swimming pool. Pets allowed. House 5 rooms 110m2. Close to the beach. terrace with barbecue. Pets allowed. New 6 rooms villa 100sq. m on the seafront. Beach 100m. Shared heated swimming pool. Garden 100sq. m with outdoor furniture, deck chairs and barbecue. no smoking. 5 Bedroom(s), 2 double bed(s). Final cleaning : 50 €. Studio Apartment 40 m2 (with lift) in the "Valdys Resort residence". Balcony with outdoor furniture and deck chairs. Shared heated indoor swimming pool. Sauna, Steam Room, fitness room. View of the sea and the bay.